In the hustle and bustle and aftermath of finalizing the steps necessary to be in a position to launch The FIRST Alive with Clive Top 20 compilation of 20 songs by December 1, 2010, World AIDS Day, including the publication of a Press Release, it occurred to me that I did not publish a Blog post to direct your attention to the Press Release and the compilation of songs, which is now available for you to purchase and enjoy. So, if you have not yet seen the Press Release with the headline, World AIDS Day 2010 Marks Start of Launch of The FIRST Alive with Clive Top 20, you can see it now when you click here. To purchase the compilation, click here. As a reminder, $10 from the sale of each compilation will be contributed to people affected by HIV/AIDS in South Africa. All 20 songs fit on one CD, which you can burn after you purchase and download the compilation. 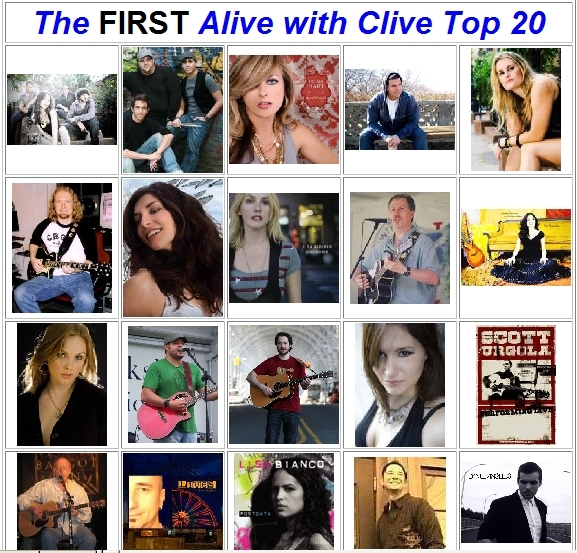 To see a Blog post on this Blog about each one of these songs and the musicians who created them, scroll down below or click on the link for Alive with Clive Top 20 under Categories in the bar to the right of the main page of my Blog. I wish you much joy in listening to the songs! This entry was posted in Alive with Clive Top 20 and tagged "Don't", "Ringing of the Bells", "Signs", "Wings of an Angel", A Better Life, Alex P. Taylor, Alive with Clive, Alive with Clive Top 20, Allison Scola, Anthony Melillo, Bryan's Song, Cassandra Kubinski, Clive Swersky, Cradle The Moon, Dan Sheehan, Daniel Angelus, Fall Apart, HIV, HIV/AIDS, Irena Hart, Jason Gisser, Jeneen Terrana, Jessica Labus, Joe Travers, Joe Venice, John Taglieri, Jump, Kylie Edmond, Lisa Bianco, Lisa Redford, Live Your Life, love, My Creation, Oh No No, PostData/We Communicate, Robert Randall, Rock Song, Scott Krokoff, Scott Urgola, Serotonen, South Africa, Starring Role, That's My Son, The FIRST Alive with Clive Top 20, The Melillo Brothers, Untied, Window, Without Love, World AIDS Day, www.alivewithclive.tv. Bookmark the permalink.